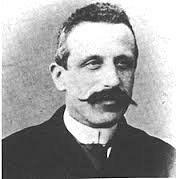 In 1898 one of the earliest photographers, Secondo Pia, took a picture of herringbone linen known as the Shroud of Turin, in the city of Turin, Italy. Secondo Pia's camera focused on the pale, subtle, sand-colored etching on the surface of the linen, purported to be the image of the crucified body of Jesus Christ. The camera lens opened, allowing light to chemically etch an image on the large photographic plate. The resulting negative showed dark images corresponding to light, and light images corresponding to dark. On a negative, a black man looks white and a white man looks black. Center of each panel shows image. Outer markings are from fold marks and scorching from a fire that almost destroyed the Shroud of Turin. The photo above, shows two views of the Shroud. On the left is the Shroud as it looks to the human eye. The panel on the right is what Secondo Pia saw when he looked at his negative plate. The Shroud itself acted like an negative. When Pia took the photo of the Shroud, the photographic plate appeared as a photograph. 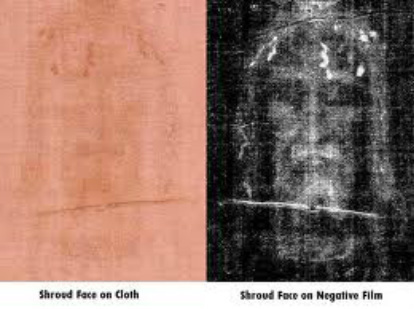 If the Shroud had been around Jesus's body at the moment of resurrection, as many believed, the image was that of Jesus. Secondo Pia had a photograph of Jesus lying dead from crucifixion. 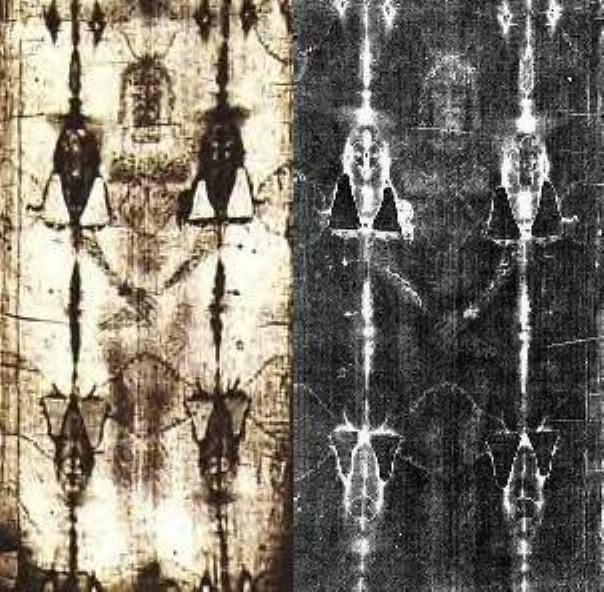 Some readers are going to remember hearing, the authenticity of the Shroud being proven false, through carbon 14 dating in 1988. That testing came under attack in 1993. A controversial theory states the shroud's fibers are coated with bacteria and fungi that skewed the carbon testing. As the carbon 14 test was the one scientific snag in my research, this 1993 question of its validity and other reservations regarding the testing, is sufficient for me to throw out the carbon 14 results. Those results had shown the Shroud was not old enough to have been the burial shroud of Jesus. Plus there is just too much other confirming data for the Shroud’s authenticity. According to tradition, when placed in the tomb Jesus's body had been packed with blocks of aloe and myrrh, with a shroud draped over the body to cover both the front and back. Thus, the midpoint of the shroud corresponded to the top of the head. The only thing remaining after Jesus's alleged resurrection was the shroud. For fourteen hundred years, the burial shroud had essentially been lost. While there is indication it had been located in Constantinople in 1203 by Crusader Robert de Clari, it is known to have been in the possession of Templar Geoffrey de Charmy in the late fourteen hundreds. By 1578 the shroud was in Turin, Italy where it has remained under control of the Catholic Church. - any organic or inorganic molecules used to create the figure, would have decomposed and penetrate the fibers, but the image is still only on the surface of the linen. - cotton fibers grown in Palestine and not Europe were detected. - coins placed upon the dead eyes correspond to the time period of Jesus’s death. In the fall of 1978, Americans associated with the Jet Propulsion Laboratory, Sandia Laboratories and the Air Force Weapons Laboratory, studied the Shroud with an expensive collection of scientific gadgets. They concluded the scorch like image on the surface of the linen, was most likely a result of some emanation of radiant energy. Radiant energy can take the forms of electromagnetic, sound, heat, light, x-rays, gamma rays, etc. The radiant energy formed the image in all directions at once. 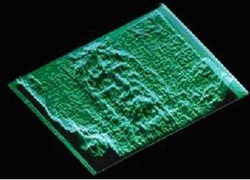 This simultaneous etching in all directions provides sufficient information concerning distance to accomplish the unbelievable: it provides sufficient data to create a 3-D picture, when a photograph of the face was put in a VP-8 Image Analyzer. The VP-8 is a computer designed for use in interstellar photos, where light sources are operating at immense distances from the camera. The Shroud of Turin is the only earthbound object that provides such 3-D images in the VP-8. Truly something extraordinary happened to the body draped in the shroud. Find out why the Shroud of Turin proves the Resurrection.